Ani Aprahamian, Frank M. Freimann Professor of Physics, has been re-appointed to the Science Advisory Committee for the Facility for Rare Isotope Beams (FRIB) at Michigan State University. The committee provides recommendations to the FRIB director on the most interesting science that should be done at the facility and the associated experimental equipment that should be implemented. The committee is composed of a group of leading scientists with rare-isotope expertise from institutions in the United States, Germany and Japan. Aprahamian’s research focuses on the evolution of nuclear structure and the impact of various structure effects on stellar and explosive astrophysical processes. Specifically, she examines the effects of nuclear structure in nuclear masses, nuclear shapes, decay lifetimes, and probabilities in terms of how these characteristics influence heavy element nucleosynthesis and the elemental abundances for the rapid neutron capture process. She has given over 160 invited talks at national and international conferences and has over 150 publications in refereed journals and book chapters. Aprahamian is highly respected in the field of nuclear physics and is active in several international and national advisory committees in nuclear science. She is an elected fellow of the AAAS and American Physical Society (APS), and serves as chair for the APS Nuclear Physics Division. 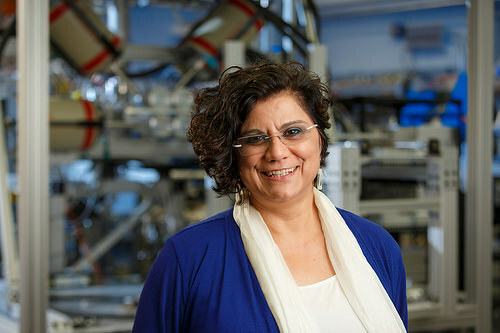 She is also the Joint Institute for Nuclear Astrophysics representative to EMMI (Extreme Matter Institute: Helmholtz Center of Excellence) at GSI, and has served as chair of the scientific council at the Grand Accélérateur National d’Ions Lourds (GANIL) in France and as a reviewer for the Institute of Physics in the United Kingdom. In planning for over 20 years, the FRIB will be a new national user facility for nuclear science that is expected to come online in 2022. The FRIB is a next-generation accelerator that will be able to produce intense beams of rare isotopes, short-lived nuclei no longer found on Earth. Scientists will be able to use the facility to study and better understand nuclear structure, the origin of elements in the universe, and the forces that shaped the evolution of the universe. Originally published by Stephanie Healey at science.nd.edu on January 08, 2015.